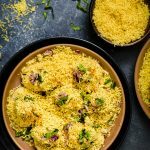 Sev Puri Recipe | Sev Batata Puri | How to make Sev Puri ? Sev Puri is a popular Mumbai Street Food snack with sweet, spicy, tangy flavors assembled in layers on a papdi. Arrange 5-6 Papdi in a plate, layer it chunks of boiled potatoes . Drizzle green chutney and red chutney on the top and add Sev on the top. Sprinkle chaat masala, cumin powder & red chilli powder. Top it with onions and coriander leaves and serve the Sev Puri immediately. You can squeeze some lemon juice on the top if you like. Its optional.